On 11 April 2019 BEIS published its Updated Energy and Emissions Projections 2018. The Grid Carbon Factor is measured in grams of CO2 equivalent emitted for each kWhr of electricity generated on the National Grid: grams CO2e/kWhr. 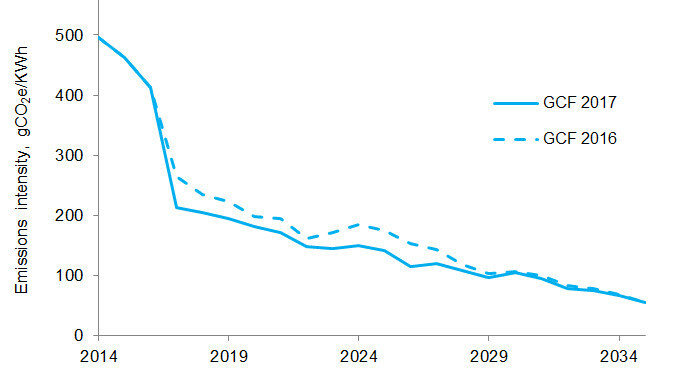 The Grid Carbon Factor shows a steady decline through to 2035, but BEIS also confirms a steeper decline than BEIS had projected a year earlier. BEIS is now predicting that the Grid Carbon Factor will be as low as 41 grams CO2e/kWhr by 2035, less than a quarter of what it is today. This reflects increased electricity generation from renewables and the switch away from burning coal in power stations. See the current grid carbon factor. On 2 January 2018 BEIS published its Updated Energy and Emissions Projections 2017. The Grid Carbon Factor not only shows a steady decline through to 2035, but BEIS also confirms the dramatic fall in carbon emissions from UK grid electricity between 2014 and 2017. Decarbonisation of the grid allows electrification of heat. The most efficient way to use electricity for heating is to employ heat pumps to arrange efficient heat transfer to buildings from the ground. The same heat pumps can be used to transfer heat out of buildings down to the ground in summer, which not only provides economical cooling but also stores heat in the ground for use the following winter: heat recycling is the ultimate in energy saving. It is now possible to chose a very efficient heating system for providing renewable heating, and renewable cooling, with no carbon emissions on site – and rapidly decreasing carbon emissions from the grid. Grid Carbon Intensity also follows a daily cycle with the Grid Carbon Intensity falling steeply around 11 pm each night and remaining low until around 6 am each morning. This provides a major Demand Side Response opportunity for those using electric heating systems to raise the core temperature of buildings in the wee small hours because the lower carbon intensity is achieved when electricity demand is lowest and the Grid can agree lower prices when demand is low. To take advantage you need to employ ground source energy for heating in winter with a control system that is tuned for weather compensation and Demand Side Response. 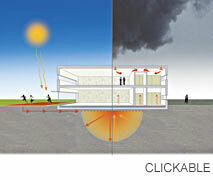 You can also take advantage if you employ heat pumps to transfer heat out of the building to the ground in summer. 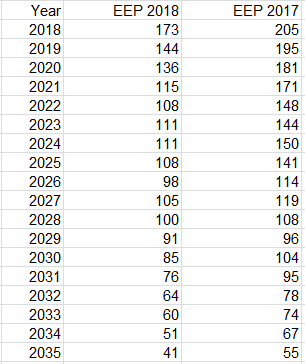 The table shows the Grid Carbon Factors projected by BEIS for the years out to 2035 and this was used to generate the graph above. The column headed "EEP 2018" shows the Energy and Emissions Projections for Grid Carbon Factors by BEIS in 2018. 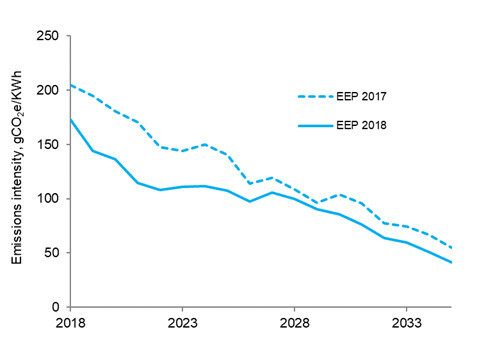 The column headed "EEP 2017" shows the Energy and Emissions Projections for Grid Carbon Factors by BEIS in 2017 (and shown as a dotted line in the first graph above) and illustrates how quickly Grid Carbon Factors have fallen ahead of recent estimates by BEIS. The Greater London Authority (GLA) issued a revised Energy Assessment Guidance in October 2018. This is to be used on preparing energy assessments as part of stategic planning applications (including developments of over 150 residential units, developments over 30 metres in height, developments on the Green Belt and on Metropolitan Open Land). Applicants are encouraged to use the updated SAP 10 carbon emission factor of 233 grams of CO2/kWh in place of the very outdated factor from SAP 2012 of 519 grams of CO2/kWh. Any applicants proposing to use the outdated SAP 2012 carbon emissions factors will need to provide a justification. If gas-engine CHP is also proposed, applicants will be expected to provide sufficient information to justify its use and to minimise the carbon and air quality impacts. This new approach of the GLA will be in place for London from January 2019 – until the Government adopts new Building Regulations with updated carbon emission factors. It seems likely that many of the UK's Local Planning Authorities will follow the lead of the GLA. See a full copy of the Mayor of London's Energy Assessment Guidance.